WILDOCEANS’ Ocean Stewards recently completed the inaugural Canyon Connections expedition in partnership with the African Coelacanth Ecosystem Programme (ACEP). The aim of the Canyon Connections project is to understand the ecology around canyon heads in the ocean. This year’s work was focused over three canyons in the Delagoa Region, Diepgat, Wright and Leven Canyon.Initiated to provide infrastructure and associated funding support for ecosystem research centred on coelacanths, ACEP is a flagship programme of the Department of Science and Technology (DST) and the National Research Foundation (NRF). The initiative was triggered by the discovery of this rare species off Sodwana Bay, South Africa, but the scope has since extended way beyond coelacanths to doing extensive ocean research implemented through the South African Institute for Aquatic Biodiversity (SAIAB). ACEP’s key partners are the Department of Environmental Affairs (DEA – Oceans and Coasts) and the South African Environmental Observation Network (SAEON).ACEP has been in partnership with WILDOCEANS for the last 5 years and has also collaborated on the Spatial Solutions and Biodiversity Surrogacy projects which provided the first visual surveys of the mesophotic habitats in the ocean in the Natal Bioregion.The Spatial Solutions project focused on the continental shelf and shelf edge between Richards Bay and Port Edward where five (5) Critical Biodiversity Areas (CBAs) were identified. Spatial solutions, such as marine protected areas (MPAs), provide important mechanisms to ensure sustainability of fisheries and to buffer global impacts. MPAs offer a cost-effective tool for mitigating risk from industrial practices such as oil and gas exploration and extraction and preventing habitat loss from seabed mining and bottom-trawling.The WILDOCEANS Ocean Stewards programme is a strategic intervention, exposing students to offshore marine research, and an initiative creating a growing community of new generation ocean advocates. The month-long Ocean Stewards Canyon Connections offshore research expedition onboard the 72 ft Research Vessel Angra Pequena, was to gather data that will be used to assist in the understanding of the biodiversity and ecology of the canyons and their shelf regions. Collected eggs and larvae of fish, small organisms floating near the ocean surface as well as mapped measurements in the water column. Baited Remote Underwater Vehicle (BRUV) and Remotely Operated Underwater Vehicle (ROV) data were collected on the benthic (seafloor) communities and the first pelagic (open ocean) BRUVs were trialled. The experience was an eye-opener for the diverse group of marine biology students who come from all walks of life. Despite having an academic interest in the marine field, for many of the students it was their first time out at sea. The young scientists had the opportunity to experience marine science research first hand while working with experienced scientists from a variety of fields. They were exposed to a range of offshore sampling techniques and research equipment. Their efforts will assist in identifying offshore areas in need of protection in support of the proposed expanded Phakisa Marine Protected Area (MPA) Network in South Africa. This year’s data collection focused on BRUV and ichthyoplankton work in areas where ROV had already been collected. In total, the Spatial Solutions project has identified 127 fish species and ROV surveys collected over 60 hours of seabed filming. Dr Harris said that since its inception in 2015, the Ocean Stewards programme has grown to include sixty-nine third year, Honours and Masters students from 5 universities across the country. The programme provides a research platform for their projects, including research equipment and operational costs. “We’re grateful to all our partners who’ve given us support on the programme. I’d like to thank Grindrod Bank and several other partners including ACEP, Ezemvelo KZN Wildlife, the South African Institute of African Biodiversity (SAIAB), the South African National Biodiversity Institute (SANBI), the South African Environmental Observation Network (SAEON), the University of Kwa-Zulu Natal (UKZN), University of Zululand (UNIZUL), the Nelson Mandela University (NMU), Department of Environmental Affairs (DEA) and the KZN Sharks board,” she added. 17 new Ocean Stewards joined the programme in April 2017. In 2018 an additional 16 students have been recruited. This year has seen an increase in the intake of students at Honours level, resulting in 10 new Ocean Stewards; 6 from the University of Zululand (UNIZUL) and 4 from UKZN. 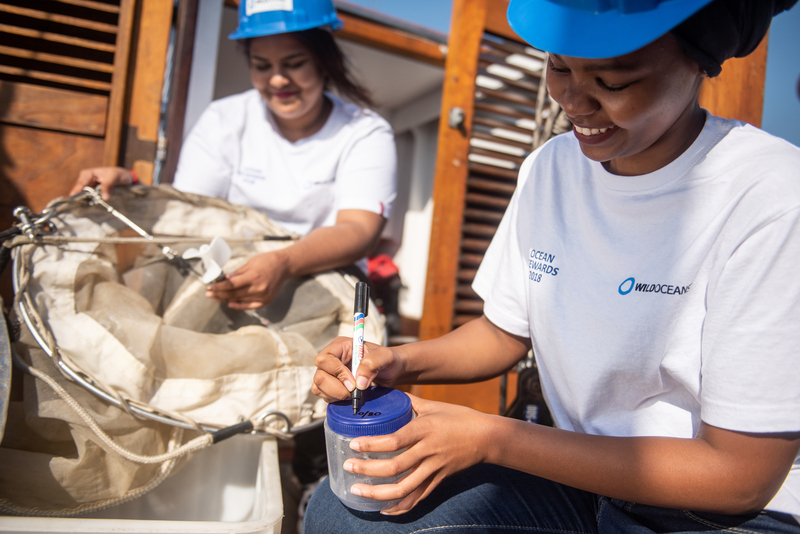 The remaining 6 Ocean Stewards joining this year are all final year undergraduate marine biology students from the University of KwaZulu-Natal (UKZN).